After court on Tuesday, May 6, it was reported that Oscar whispered to Kim Myers, “how do you sleep at night?” while walking past her in the gallery. Reeva was very close to the Myers family and had been living with them in Johannesburg since September 2012. It is not known why Oscar made that comment to Kim, but it was witnessed by other people in court. Kim’s father, Cecil Myers, had previously talked to the press about Reeva and her relationship with Oscar, but that had been several months before. More details about the comment that Oscar made in court, as well as details about the Myers family, can be found at the links below. When they resumed court today, Mark Batchelor was seen sitting next to the Myers family providing a human barricade between them and the Pistorius clan. To read more about Mr. Batchelor, see my post for Day 20 of the trial. He was a part of the argument with Mr. Quinton van der Burgh over Samantha Taylor. He is the large, blonde man seated on the right. The first witness today is Professor Christina Lundgren. She is an anesthetist who will speak about the topic of gastric emptying. She has been practicing since 1979. She testifies that one of the most dangerous complications of general anesthesia is the regurgitation of stomach contacts in to the pharynx and then aspiration in to the lungs. She says this is an absolute disaster when this happens during surgery but there are many measures that can be taken to avoid this. They try to make sure that the patient’s stomach is empty when they arrive for surgery so they assign time periods in which the person is not to eat and/or drink certain liquids. Prior to anesthesia, the doctors need to define the timing of the last meal along with the volume (last oral intake). They also take in to account the injuries, such as a head injury, because there are physiological factors that can delay stomach emptying. SA does not have their own guidelines for oral intake prior to surgery therefore they follow the standard guidelines of other countries. Patients are given instruction on what they can eat and drink prior to surgery. She states that 10% of a low fat meal will typically remain in the stomach after four hours. And even when the guidelines are followed, it’s not always an exact science. She gave an example of one of her patients who had not eaten solid foods for many hours and still regurgitated food under anesthesia. There are many internal and external factors that may affect stomach emptying including neurological, emotional and hormonal interactions. Pain and anxiety in particular can delay the process. It’s been thought very recently that pre-menopausal women may also delay emptying. Sleep is an accepted factor that can also cause stomach emptying delay. Smoking delays it as well. Alcohol may delay or increase the process. And diseases also need to be taken in to account. Psychological and eating disorders, prescription medications, recreational drugs and slimming aids are additional causes for gastric emptying delay. The professor then continues by saying that she was asked to be there today to comment on the stomach contents for the deceased. She would like to state that she is a practicing clinician; she is not a forensic pathologist. The evidence (from Oscar) indicates that Reeva ate a chicken stir fry dinner at approximately 7-8pm on February 13, 2013. The professor says that in her professional opinion, the factors that may have affected emptying in this case are: the meal contained insoluble fiber, Reeva was pre-menopausal, not known if she was on medication, she had performed yoga that night, not known if she had bulimia or anorexia, and it was stated that she had slept that evening. All of these could have had an effect on her stomach contents. She then states in an ideal world, after 6 hours of fasting after the meal, her stomach should have probably been empty. But there are so many unknowns that she cannot state anything as fact. It’s only speculative. The professor states that she did consult with a gastroenterologist who agreed with her findings. Nel objects and states that is pure hearsay (to state that an unnamed gastroenterologist agrees with her). Roux accepts that and agrees. The Judge expunges it from the record. Roux then refers to two publications that support her findings. Roux rests and Nel is up. He asks for a brief adjournment, as he only just received the Professor’s report today. Nel starts by saying to the Professor that he believes her information is balanced, and there are many things that he agrees with. But there are a few things that he will need to test. He asks her if she has read Professor Saayman’s evidence. She says yes. Nel points out to her that all of the possible causes of stomach emptying that she mentioned earlier are not based on facts or known conditions, just possible causes (with the exception of Reeva being pre-menopausal). 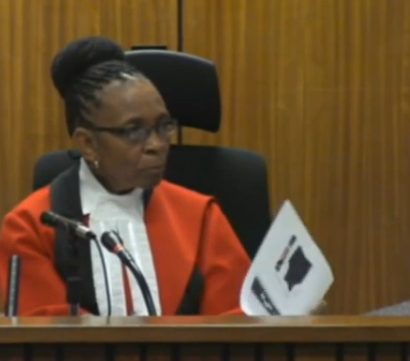 She agrees that she doesn’t know whether or not those conditions applied to Reeva. Nel asks her if she has read Professor Botha’s evidence. She says yes. Nel points out that Professor Saayman said that gastric emptying is not an exact science. She agrees. He also said there are indeed fairly good timelines that have been established from physiological guidelines. She agrees. And this is important because, as stated above, surgeons need to make sure that the stomach is empty so the patient does not regurgitate under anesthesia. The professor then says it is commonly accepted amongst her peers that 4 hours for solid food may well be insufficient for emptying and a minimum of 6 hours is required. The professor agrees with Saayman’s statement that the content of the food is also relevant to emptying. She adds, particularly the fat, carbohydrate and insoluble fiber content. The next relevant factor is the volume of food. She would like to add that even though in reality, 6 hours is typically enough allowable time for emptying, most surgeons in SA like to be extra conservative for safety purposes and have a longer period of time. Nel then turns to a page in Saayman’s report that deals with gastric emptying post-mortem and the professor says that is not her area of expertise, so he moves on. Nel then tells her that under cross-examination, the accused stated that they ate dinner closer to 7pm that evening, and using an approximate time of her being shot around 3am, that is an 8 hour time span in which she did not eat. 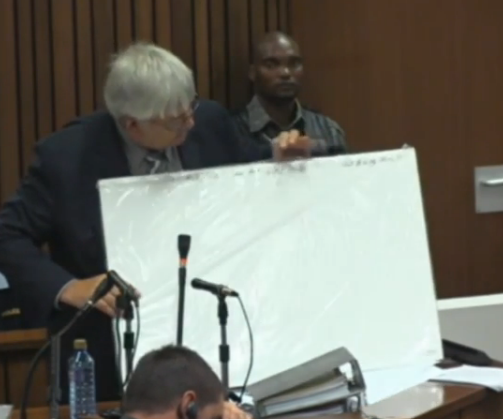 He asks her if she has seen a photo of the contents of Reeva’s stomach. She says yes, it was a photo of green, gelatinous substance. Nel wants to know, if Reeva was just a normal person who had something to eat and went to bed, would she expect that Reeva’s stomach would be empty after 6 hours? She says that she doesn’t believe anybody can categorically state that it would have been empty. Reeva ate stir fry with insoluble fiber and she went to sleep, those are factors that can cause delay, in addition to being pre-menopausal. Nel asks what is exceptional about a stir fry meal? It’s just chicken and vegetables. Sarcastically he asks, does she warn her patients not to have a stir fry meal before surgery? The gallery chuckles and Nel tells her that he’s not being funny. He wants to know what is so exceptional about this food. She says that she warns all of her patients to eat something light. Nel goes on to say that Saayman was able to identify that the contents were vegetables (without knowing what she had to eat), and doesn’t that mean that if he can still identify the food that the process has not been taking place very long. She is not able to answer that. All she can say is that the stomach is not empty. Nel asks if digestion alters the physical nature of the food. She says it does unless it’s insoluble fiber. Nel says, so after 8 hours, one would still be able to identify the food? She asks to see the photo again. He says he’ll show it to her again but he wants to address what Saayman said. So one day after the shooting, Saayman was still able to identify the meal that Reeva had that prior evening. Nel wants to know what she thinks about that. The professor says that cheese can be a high fat meal and can take a long time to empty, as can insoluble fiber. Nel replies, that’s not the question. He wants to know, wouldn’t you have expected the digestive process to cause the contents to be unrecognizable after 8 hours? She says she can’t answer that. Nel says, Saayman can… and he did. Nel wants to read one more item from Saayman’s report. It says, “post-mortem, after death, the gastric emptying stops but the physical break down of the food, the digestion because of the enzymes and the hydrochloric acid, etc, continues breaking down the food.” Nel asks her if she has a view on this. She says she is a clinician, she deals with live patients. She has immense respect for Saayman who is a forensic pathologist and his patients are deceased. 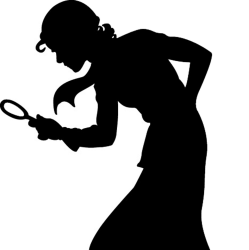 She did try to find information on the enzymes continuing to work in post-mortem, especially if the body is refrigerated, and she was unable to find any evidence either way. Nel tells the professor that even though Reeva died sometime around 3am, she remained on the scene for hours until her remains were removed and refrigerated. That should also be taken in to account. 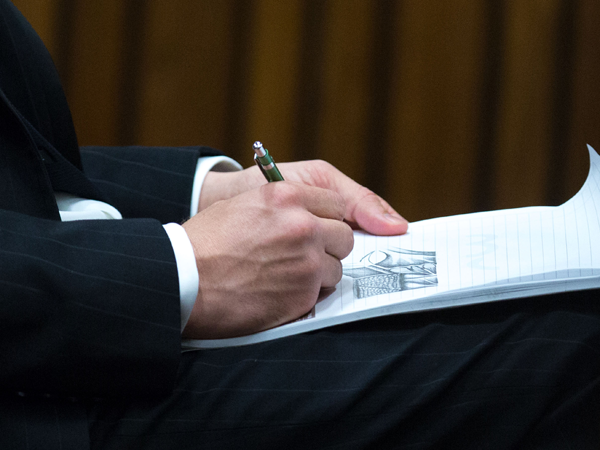 The Judge asks Nel for the number of hours that the body remained on the scene. Nel says her body was turned over to the mortuary at 11:45am. The professor also says she did not consult with Oscar, but she did read the court transcript of his testimony and that is how she obtained the details about what they ate and the time of the meal. Nel goes back to the professor’s earlier statement that typically after 4 hours one could expect only 10% of that meal to still be present in the stomach. Considering Reeva was found with 200ml in her stomach, Nel calculates that she must have eaten 2 liters of food 4 hours before death. That is quite a large amount of food and extremely unlikely that Reeva ate that much. The professor does not recall that she was found with 200ml in her stomach, but Nel assures her that measurement is accurate and is in Saayman’s report. Would she expect Reeva to have taken in 2 liters of food 4 hours before her death? She says she is not aware that Reeva ate food 4 hours before. Nel says, if we then go back 8 hours to when Oscar says she last ate, then she would have taken in 4 liters of food. That is basically impossible. Nel says the more probable scenario is what Saayman reported; she likely took food 2 hours prior to her death. She reads from Knight’s resource that it’s not advisable to estimate the last meal from what is found in the stomach at the time of death. She is not prepared to comment on Saayman’s opinion. 1. Saayman was able to determine the type of food that was eaten a full day after death, indicating that food had not been in her stomach very long before death. 2. There was still 200ml of food in her stomach. One would expect that after 8 hours of digestion, the volume would either be none or a great deal less than that. 3. After 8 hours of digestion, any remaining food should theoretically be unrecognizable due to stomach enzymes. 4. Saayman is a pathologist. This is his area of expertise. Lundgren is a clinician. Although gastric emptying is relevant to what she does, she is not as qualified to comment as Saayman, nor was she present for the autopsy. The next witness is Ingrid van Schalkwyk. In February 2013, she worked with the Dept of Social Development as a social worker. She had been working there since 1989. On the morning that Oscar first appeared in court on February 15, 2013, the court asked her to speak with Oscar. She was also asked by the court manager to assist Oscar throughout the whole bail application. She believes she was asked to do this to provide emotional support, as well as to monitor his behavior. She was not working on behalf of the Defense. She was requested by the Defense last year to testify but due to the fact that she didn’t know the merits of the case she didn’t think she could contribute to the case. But after reading what was said during trial, she decided to come forward. She was upset that people were claiming Oscar was putting on a show for court. So she approached the Defense on May 6, 2014, two days prior to her being on the stand. She states, from the first moment she saw him, Oscar was a man who was heartbroken. He cried and was in mourning. He was very sorry about Reeva’s loss, especially for her parents. Mrs. van Schalkwyk then says “he loved her” and Nel stands up to object. Nel states this is evidence of a previous consistent statement. Roux says this witness deals with the State’s assertions that Oscar was fabricating his emotions; that he wasn’t sorry for Reeva, he was only sorry for himself. They are rebutting this assertion. Nel disagrees. He states that he never said it was a previous inconsistent statement. He says he waited for the witness to testify that he said he’s sorry for Reeva, that he loved Reeva… this is previous consistent statement and it’s inadmissible. He goes on to say that if Roux says it’s about something different, and it’s perhaps just emotions that they are testifying about, then that’s different. But it can’t be about what the accused said. Roux says you can’t factor the words out of the emotions; that’s the whole package. It is relevant and it’s for the court to decide how much weight they will give to it. He says this testimony is to give the court the full picture of what happened coming from somebody who is independent from the Defense. Nel says Roux can’t argue it’s not from the Defense side, it’s their witness. Nel says, what somebody says after the incident while distraught is not relevant to the actual charges. Nel says we’re not dealing with sentencing at this point, we’re dealing with the charges. The Judge believes it is relevant because during cross-examination Nel challenged Oscar about using his emotions as an excuse. Nel says he has objected for the record and if the court feels it is relevant then he can’t take his argument any further. The Judge allows Mrs. van Schalkwyk to proceed with her testimony. She states that Oscar cried 80% of the time. Oscar expressed to her how he and Reeva had planned for their future. He was worried about what Reeva’s family was going through. One of the conditions of his bail release was that he needed to be monitored and the social worker had to provide weekly reports. She did this up until the bail conditions changed. •	OP held a small memorial service for Reeva at his uncle’s house. He was emotionally drained. •	OP is cooperative and motivated to subject to the conditions provided by the court. •	OP was tested for prohibitive substances on Feb 28, 2013, and the results were negative. •	OP is heartbroken. He has a lot of emotions and stress. Dr. Lore Hartzenberg is the lady in red on the left. •	The psychologist states that OP is still experiencing physical and emotional reactions. •	OP is fully compliant to the conditions. •	He was tested again for substances on March 8, and was negative. •	OP is fully compliant. •	The psychologist met with him again. He is not suicidal as said in the newspaper. •	Even though he is heartbroken, he is coping with the situation. •	He was not tested again for substances. •	He spoke with the psychologist again and she found he is slowly improving and coping with the situation. •	Still working through his heartbrokenness in therapy and also in art therapy. •	He was tested again on March 19, and he was negative for substances. •	He is still compliant with conditions. It looks like Oscar is still enjoying the art therapy. Roux asks, aside from Oscar’s crying and the talks that they had, were there other things that she observed during this time? She says he vomited twice. One time when he came out of court he cried uncontrollably and they had to calm him down. Nel says to Mrs. van Schalkwyk, so the first time you met Oscar was right after his court appearance and he was crying and feeling sorry for himself? She says no, she doesn’t agree that he felt sorry for himself. Nel asks her, why? She states that he told her that he suffered a loss, he misses Reeva. Nel asks, did he say he killed her? She says no. He also asks, did he say he shot her? She says he later on told her that. But Nel wants to know about the first day they met. She says no, he didn’t mention anything about the case and she actually told him that she didn’t want to know about the case. Nel says, most accused people feel traumatized after they have been arrested. She agrees with that. Nel asks her if she has dealt with other family murder matters. She says yes. Nel says, those people all act in the same way. She says that when she sees accused people, it is for her report or for pre-trial; it is never directly after arrest so she can’t comment on that. Oscar is the only accused she has ever seen shortly after arrest. 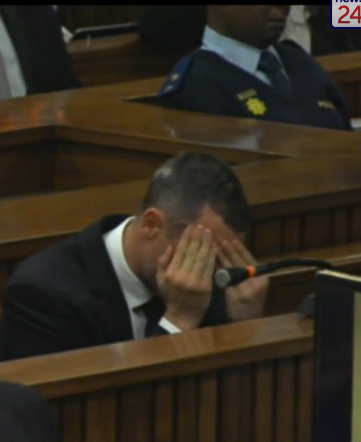 Nel asks, you saw the accused after arrest and he was crying and felt sorry for Reeva? She answers, he said that “he misses Reeva so much.” Those were the first words he said to her. Nel asks, considering he had just shot and killed her the day before, does that make sense? She answers that he told her (not that day, but later on) that he accidentally shot and killed her. Nel says…. OK. So he told you that he accidentally shot her? Mrs. van Schalkwyk says yes, those are the words that he used. Nel asks her if she is aware of what his defense is. She says no. Nel tells her that Oscar thought he was under attack by intruders and that is why he fired. Nel tells her that he has changed his story since he talked to you. She says they did not talk about the merits of the case. Later on after he was released on bail, they talked therapeutically about the situation. He told her that he accidentally shot her, and he felt bad because he accidentally shot her. Nel establishes that Mrs. van Schalkwyk was never present when Dr. Hartzenberg conducted interviews with Oscar. Everything that is mentioned in van Schalkwyk’s reports about Dr. Hartzenberg is not directly from Hartzenberg nor has she seen her reports. Nel asks her why she wanted to testify in court. She says that it upset her to read in the newspaper that Oscar was not sincere about his feelings. She wanted to come and give her observation. Nel asks her, for a normal person that had just shot somebody, what would you expect their emotions to be? She says that each person is different, they react differently. Nel says, that’s true, but if you saw somebody who had just shot and killed a person the day before and they had just come from court where there were lots of people watching them, wouldn’t you expect a person to be traumatized? She says, that’s correct. She goes on to say that Oscar was emotional; he kept talking about Reeva’s parents. 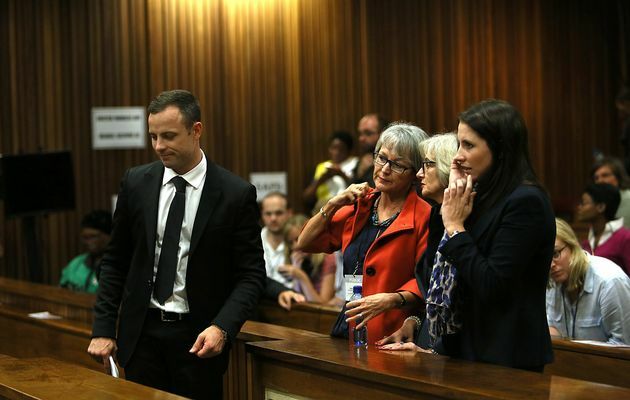 Nel points out that one thing Oscar has never said is “I’m so sorry.” Mrs. van Schalkwyk says that he was sorry. Nel says no, he never said that. She says, he told her that he was sorry about what had happened. Nel says no, you would have said that to us. She says they had five days together with many discussions. This may seem like a trivial nit-picking over words but I do think the content of what Oscar said is telling. For somebody who genuinely just killed a person by accident, you would think they would absolutely hate themselves. They would probably go on and on about how sorry they were for their actions, how stupid their actions were, how they will never forgive themselves. I know that is speculation, but it seems like a more normal response than what Oscar does… from the beginning (literally as early as minutes after her death) he seems to be totally preoccupied with defending his intruder story. He says it over and over, as if a robot… I thought she was an intruder. It does not ring true of somebody who is devastated and mortified over what THEY have just done. Van Schalkwyk states that her sole purpose was to provide emotional support, not to assess him. She wasn’t looking for remorse. Nel does not chastise her for not looking for remorse; he just wants to know her professional opinion. Isn’t sincere remorse admitting/accepting what one has done? She agrees with that. Oscar did not say that he was sorry for what he did, he only expressed emotions about his heartbrokenness but she expected that because she was there to deal with his emotions. Nel establishes that her only role was to provide support and monitor his mental state and health. Apart from referring him to a psychologist, she did not run any psychological tests on him. Nel reconfirms that the first time she saw Oscar was in court on February 15, 2013. That morning, she had no indication of the facts of the matter. She learned about his version through the bail proceedings. She later learned about what was happening in his trial through the media. Nel asks, you felt sorry for the accused on Feburary 15, 2013? She says that after 24 years of experience, she has empathy for what people are going through. Nel asks her if it bothered her that he never said he was sorry for what he did during their meetings throughout the bail application. She says that everybody is different. He was traumatized and heartbroken. Nel says that other people also witnessed him being traumatized that morning when he carried Reeva’s body down the stairs. Nel has no further questions but considering that the State’s psychologist is not in court today to consult with, he would like to reserve the right to recall the witness if additional questions come up. 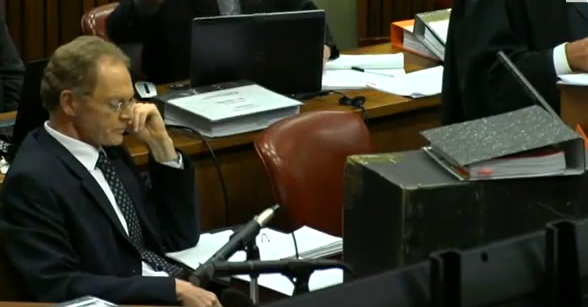 Roux asks her if Oscar explained the “accident” to bring it in to further context. She says yes. Roux says, without going in to the facts, what was the explanation. She says that he thought there was an intruder, he got his firearm and went in to the bathroom. He heard noise. No further questions from Roux. The witness is excused but may be recalled if necessary. In my opinion, this witness was useless. She was appointed by the court as an emotional support system for Oscar, so of course he is going to be emotional with her. She admittedly did not know any details of the killing (he could be a serial killer for all she knew), nor did she know any background information on Oscar, and she decided he was sincere because he was crying. If I were the Judge, I would give it zero weight. The next witness is “Wollie” Wolmarans. I will refer to him as Wollie. He states to the Judge that he is hard of hearing. He also says that he will testify in English, but he speaks Afrikaans so if he runs in to difficulty, he will ask the interpreter for help. He is very difficult to understand, not only because of the language barrier, but also because he has a tendency to ramble on with his answers. Often times Roux would cut him off and redirect him to shorten his answers. Wollie is the Defense ballistics expert. He graduated in 1965 and gained experience in the army. He then joined the SAPS. He was employed by the confiscated firearms section for about 5-6 years. He was transferred to the criminal bureau and trained in fingerprints. He was later transferred to ballistics. He has extensive experience with firearms. He is also a tool mark examiner. He resigned from SAPS in 1992, and has since worked as a private forensic consultant. He is a well respected ballistics consultant but in my opinion, is past his prime. 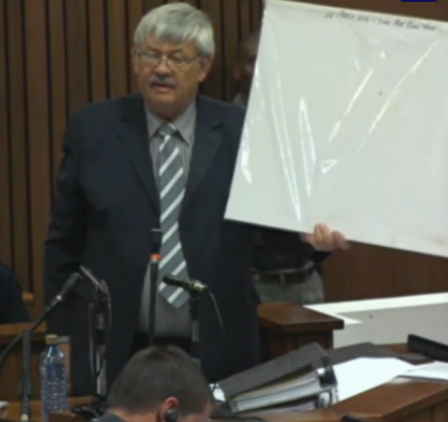 Roux hands up the report that Wollie compiled. •	Whether or not Oscar was on his prosthetics when he fired the shots. •	Whether or not Oscar was standing approximately 1.5 meters in front of the toilet door when he fired. 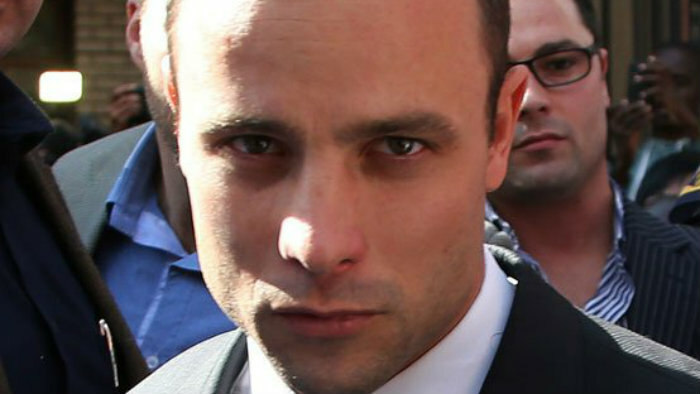 Roux points out that the State no longer disputes that Oscar was on his stumps when he fired the shots and also it could not be stated with certainty that he was standing 1.5 meters away. Both Wollie and Mangena came to the same conclusions regarding the above two matters. Wollie arrived at the crime scene on February 17, to investigate after the scene was released by police. The scene was secure and the key was handed to him by Mr. Christian Stander at 15:54. He entered in protective clothing. He did a walk through and took photographs. Mr. van der Westhuisen was also present and took photographs. Two investigators from CSI Africa arrived on the scene around 17:40, and wore protective clothing. They did a fingerprint investigation. It was found that the toilet door had been removed by police for safe keeping. On February 18, at 21:44, Wollie removed a fragment of a bullet from the toilet bowl (that the police had missed). Unfortunately the video feed cut out after this so I missed a portion of the testimony. It picked up again with Wollie talking about the testing they had done and also about the Black Talon bullets. He explains how hard they are to get as they are no longer manufactured. He had to really pull some strings to get his hands on a few of them for testing. He goes on to explain that shots were fired from a position which was previously determined by Mangena. This was recreated by positioning the door and the point of aim according to measurements made at the crime scene to accord with Mangena’s measurements. They used witness boards at varying distances from 6cm to 60cm behind the door to establish the distribution pattern of wood splinters and fragments caused by the bullet perforating the door. They look at the first board which was at 6cm behind the door. 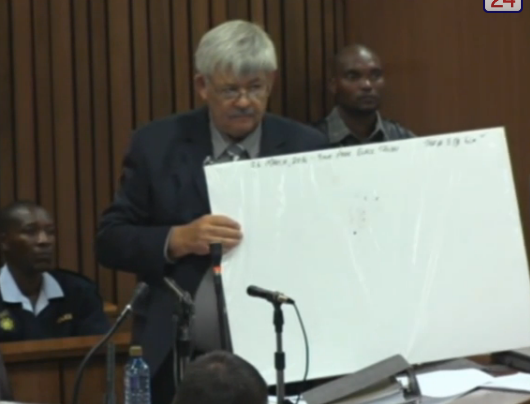 The splinters seen on this board are consistent with the wound pattern seen on Reeva’s upper arm. The next board was placed at 20cm. 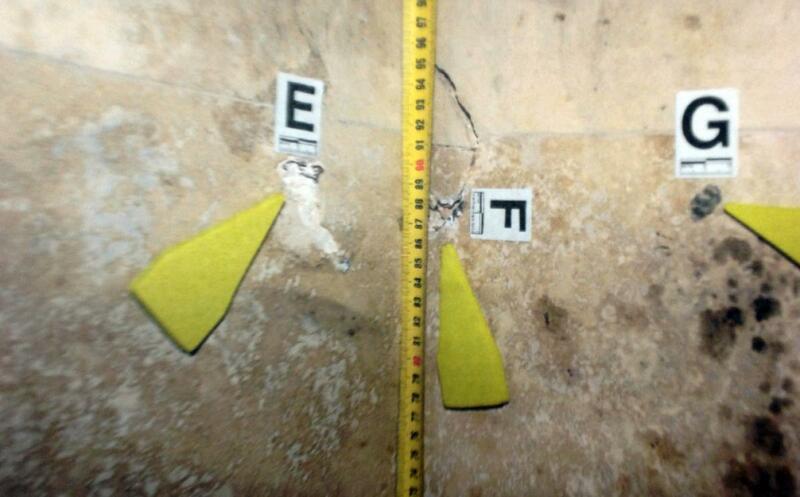 The dispersion pattern was much wider, although there are a few splinters close to the bullet hole. It’s possible that this distance could also be consistent with the upper arm wound. The third board was 30cm behind the door. Wollie points out that the boards say “Black Talon” at the top because at the time he was under the impression that was the bullet used, not the Rangers. Apparently in testimony which must have been missed by the feed earlier, he testified about Oscar using Ranger bullets, not Black Talons. Hopefully I can pick up more details about this in his testimony during Nel’s cross-examination. At 30cm, there are even less splinters. He can only see a few of them and some didn’t even penetrate the board. The pattern is inconsistent with the pattern seen on the upper arm. The final board was placed at 60cm behind the door. This pattern is also inconsistent with the pattern seen on the upper arm. 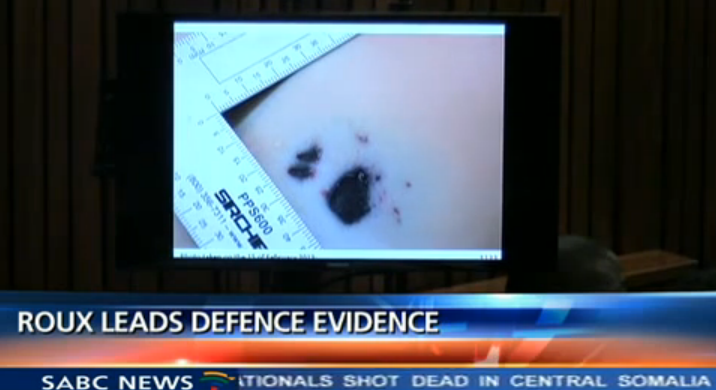 Wollie’s conclusion is that Reeva’s right upper arm was between 6-20cm away from the door when hit by the bullet. The next testing that they did was the cricket bat on the door. And like clockwork, Oscar hides behind his hands. Wollie found that a cricket bat did strike the upper right side of the door panel. There are three distinct marks on the door caused by the bat. The marks are consistent with the bat striking the door at an angle. They next look at bullet mark E and F on the toilet room wall. One of the bullets that went through the door hit the wall at point E. It then ricocheted to F, causing the tile to break. A fragment lead core weighing 65.9 grains was found in the toilet bowl, along with a piece of the broken tile, by Wollie. The mark G on the wall was caused by a fragment exiting the head wound. Both he and Mangena are in agreement on this. The vest (tank top) was examined to see the extent of damage caused by bullets, bone fragments and possible wood splinters. The front of the vest shows damage. There is a hole in the right front area of the chest (below the breast), per Saayman’s post-morten report. The damage to the shirt is consistent with the wound. A fragmented jacket (marked H) was found in the shirt. It has 2 grooves and weighs 17.2 grains. Wollie points out that the fragment has a black appearance. You can’t see the talons but it’s very similar to a Ranger with a black tip. 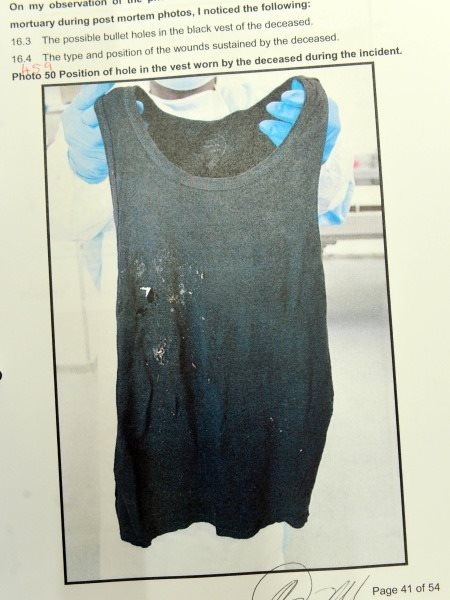 They next look at a photo of the back of the shirt, which Wollie took at the forensic lab on Nov 8, 2013. He couldn’t find any defects. There was no sign that a bullet had come in to contact with the back. They also take a look at a photo of the shorts worn by Reeva that night. He points out that there is a bullet hole in the elastic band. The next photo is a close-up of the buttock bruise. Most of these photos are not shown in court, but I did capture a screen shot from a previous day in testimony which showed some thumbnails from the post-mortem. (thank you to homegirl from WS for blowing this up). It’s still a little grainy, but this gives you an idea of the size of the bruise. See the middle picture. Wollie says it is not possible to determine with total accuracy the sequence of the shots or the body position of the deceased. But he does agree that the bullet from hole A hit her in the hip. She was in the upright position at an angle toward the door, possibly leaning forward to some extent because of the eccentric abrasion ring of the wound. According to Saayman’s report, the right hip would have immediately become unstable and she would be incapable of voluntary movement. She would have started to collapse. The position of the probe in the hip wound (photo taken at autopsy) shows an upwards trajectory. The secondary wounds seen on the hip were possibly caused by wood splinters. It is difficult to determine the approximate distance to the door due to the clothing that could have prevented injury from the splinters. 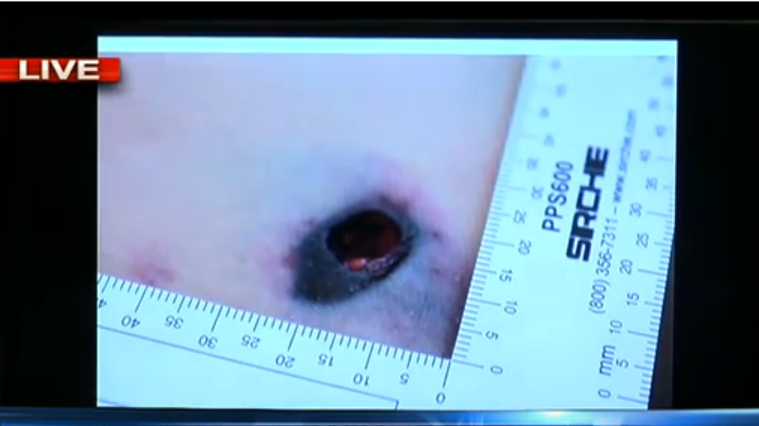 For bullet hold B, he believes this was the wound to the upper arm. The abrasion wounds to the right chest (below the breast) could be related to the entrance/exit wound of the upper arm. The height of these wounds was 117cm above the heel of the right foot. 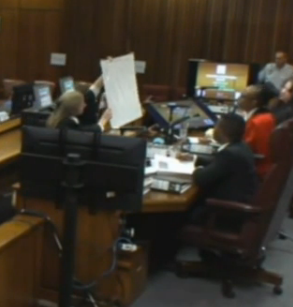 Roux points out there are secondary wounds around the entrance wound to the arm. It is time to adjourn for the day so they will continue with Wollie’s findings tomorrow. I’m about to read your much awaited post – thank you! But I must say, the phot you chose to present on this Day 27 makes my skin crawl just that little bit. One hell of a frightening look he has, can have, must have had on that horrific night. I cannot help but imagine this is was Reeva saw as he fired at her. I agree, it is a creepy picture! He can definitely have some pretty intense looks. Thank you again for you brilliant and extensive work! It is strange to me, how ‘weak’ all the defences witnesses seem to be, but maybe it’s just in the natur of the ‘incident’ – if it happened as Gerry Nel (and the most of us) assume – then the witnesses can just be ‘weak’ – because they try to suppurt a made-up story/lie. Same story with the psychiatric evaluation now – OP exaggerated tremendiusly about his ‘panic’ and ‘fear’ to find an explanation/cover-up, why he fired – ‘mitigating circumstance – so it is essential for the court, whether there are such ‘mitigating circumstances’! I just love it when the liar, who killed such a beautiful, intelligent, amiable woman, gets caught up in his web of lies and finally falls. Nevertheless I also feel kind of compassion for a person, who had it all and a bright future and then fucked up so maximally. destroying Reevas and her familys and friends lifes and his own too. I really think the weak witnesses are a result of an incredibly difficult case to fight, and an equally difficult defendant. When OP was on the stand for those 7 days, I think he probably gave Roux a good dose of heartburn with all his changing and adding of details. This psych evaluation is going to be huge. If his assessment comes back that he does not have an abnormal level of anxiety or fear, then I think that is absolutely the end of the road for his story. In my opinion, it’s already the end of the road, but for anybody who is still on the fence and for the Judge, I don’t know how they could believe him without intense anxiety attached to his actions that night. And in the event that he is found to have some disorders, it’s still up to the court to assign a weight to them. It will be interesting… can’t wait to see how it all pans out. I like reading ure blogs they are so informative n fill in gaps. Keepup d good work.